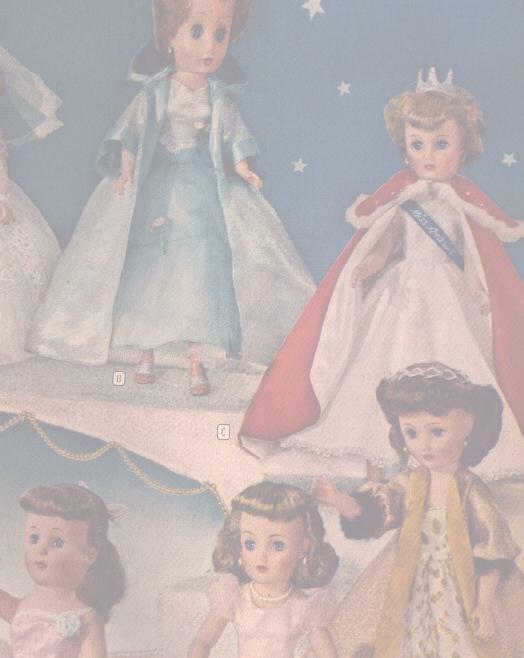 PMA (Plastic Molded Arts) issued the Miss Joan dolls in 1956. She appeared in the 1956 Sears Christmas catalog showing a wardrobe of outfits and a doll. PMA made many hard plastic dolls in the 1950's, but Miss Joan was quite unusual for her interesting size at 12" rather than the standard 10 1/2" fashion doll size and her excellent quality. Miss Joan had a glued on saran wig in 1956 and rooted hair in 1957. 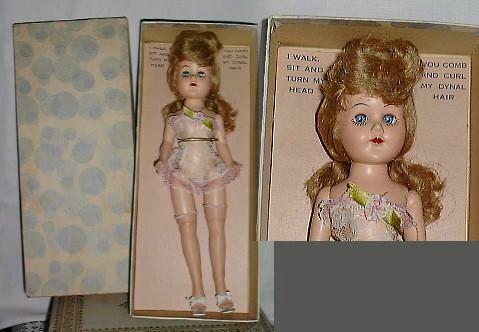 These dolls were all hard plastic, except in 1957, they had a soft vinyl head with rooted hair. They had an extra joint at the knees. A little Miss Joan doll was released in 1958. She was 8" tall. All the Miss Joan dolls are "walkers" as when you move their legs her head turns from side to side. Miss Joan dolls are unmarked except for a patent pending marking on their backs. An early Miss Joan from 1956 with glued on saran hair in her original box. Another early Miss Joan with a home made outfit. Two Miss Joans, one from 1956 with glued on blonde wig and one from 1957 with rooted brunette hair. The newer verson has the same hard plastic body with jointed knees, but has a vinyl head with rooted hair. 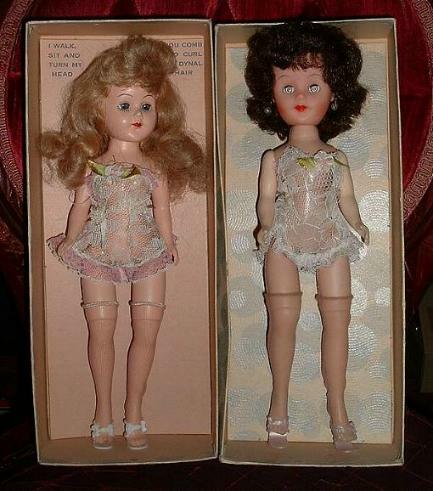 Both wear original lace teddies, stockings and plastic high heel shoes. The 1957 box is also different from the earlier version with no writing on the back of the box, just the blue bubble design. The harder to find Little Miss Joan. She is 8" tall, also has jointed knees and a hard plastic body and head with glued on saran wig. She has blue sleep eyes and is also a walker like her big sister. 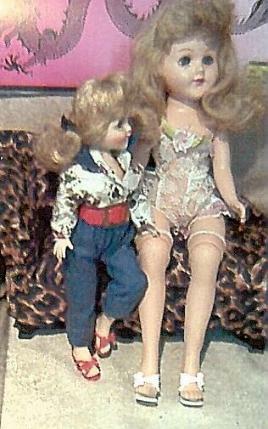 Little Miss Joan and her big sister showing their poseable legs. 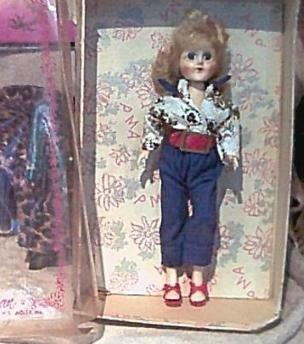 This unusual doll resembles a PMA doll, but is not 12" tall like Miss Joan. I found her dressed like this as Cleopatra and wanted her for my Egyptian collection. Her outfit is vintage but she has no markings. She is only 10.5" tall, but is all hard plastic with sleep eyes and the walking mechanism.